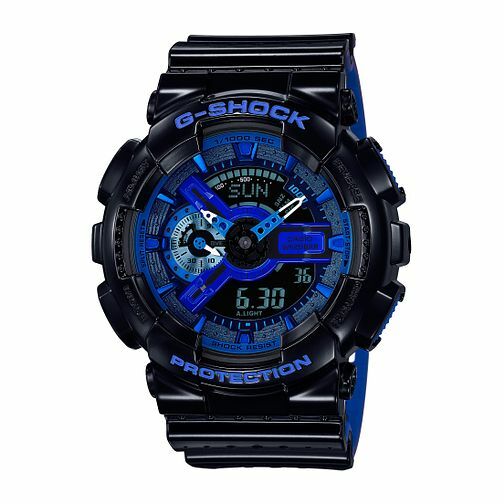 Get sporty and rugged style, with this tough black resin strap watch from the G-Shock collection. Shock resistant with analogue and digital display, countdown timer and 200 metres water resistance, and styled with vibrant blue accents for a splash of colour. Casio G-Shock Men's Combi Black Resin Strap Watch is rated 5.0 out of 5 by 5. Rated 5 out of 5 by Anonymous from Smart, modern and affordable Great colouring design and comfortable to wear. My partner likes watches which stand out and this watch is very attractive.